Gold and Emerald Well — a source of relaxation — Beer bath. Combination of selected ingredients: hops, malt, purest water, and original Czech beer «Kynšperský Zajíc».". Hops are considered the emerald of the Czech Republic. Malt and beer are perceived as the real Czech gold. Beer bath will give you the right rejuvenating procedure! Treat yourself to a hot bath full of herbal extracts, oak or larch, brewer´s yeasts and hops, which is due to the large amount of essential oilsability to eliminate fatigue, revitalize the skin and relax the whole body. The quoted price is 1 hour. 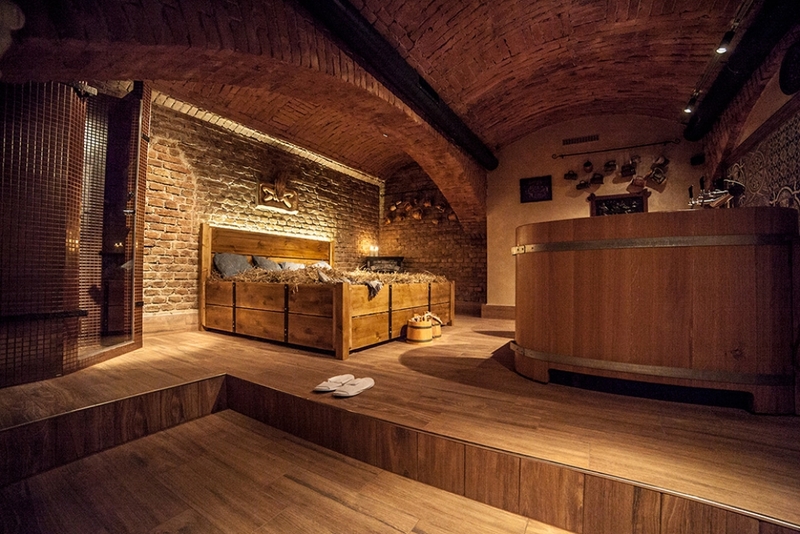 We will fill a hot tub made of the royal oak or larch with a capacity of 1,000 liters. We will add dark beer to the tub with a water temperature of 35 — 38 °C, mixed in a specific ratio of brewer’s yeast and natural crumbled component of selected varieties of hops and malt. Hops have medicinal properties due to their high content of essential oil. They have soothing anti-inflammatory and antibacterial effects. Hop oil perfectly removes fatigue. Malt is the soul of beer. Due to malt beer contains carbohydrates, proteins, minerals and healthy organic acids and vitamins. Brewer’s yeasts excrete a number of vitamins B into the skin, support hydration and regeneration of the upper skin layers. In order to enhance the effect of this bath, we recommend drinking a glass of dark or light beer. During the beer bath, you can pour yourself as much of the original Czech beer «Kynšperský Zajíc» as you like. Treatment of psoriasis, cellulite, acne, skin regeneration, back pain and joint pain, positive impact on the body in nervous overload, stress, lowering blood pressure, improving blood circulation. Patients with high blood pressure, after cardiac surgery, pregnant women from the third month of pregnancy and children under 18 years of age. 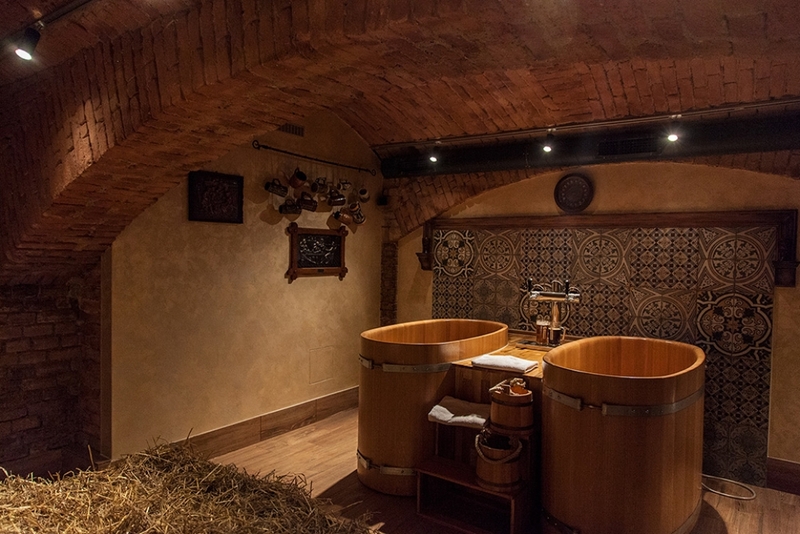 Hot bath in a tub made of oak, containing tannin, gallic and ellagic acids, pentosans, pectins, fatty oil. This bath has a positive effect on a number of significant processes in your body, especially on thermoregulation and metabolic processes (which helps to lose weight), cardiovascular system, and respiratory functions. Oak spa provides you with a wonderful opportunity to improve your health condition and keep it for many years to come. Bathtubs for these baths are made according to the traditions of the cooper art without any use of anchors, adhesives or paints, so that they are completely environment friendly. Due to the absence of chemical treatment, the wood is in direct contact with the water and saturates it with its medicinal components. Their content is very high and is supported by many studies and thousands of years of experience. Bath in an oak tub with a water temperature of 37-38°C helps to normalize sleep, relieves stress and irritation. In addition, this pleasant bath improves skin elasticity, has a rejuvenating effect and, therefore, is a real blessing for the body care, beauty, and mental state.